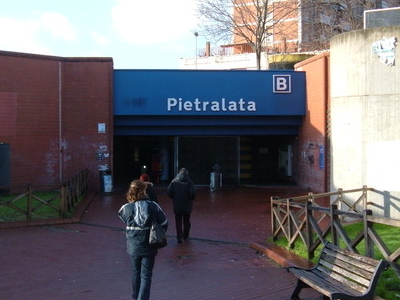 Pietralata is a station on Line B of the Rome Metro. It is located on via di Pietralata, after which it is named, in the Pietralata quarter, the 21st quarter of Rome, near the Forte Tiburtino and the Autostrada A24. It opened on 8 December 1990. It was originally to have been known as Feronia, after the street of that name not far from where the station was to be sited, but it was decided that that name would actually be given to the station now known as Quintiliani and only a few months before its opening to the public it was decided to give it is present name. Here's the our members favorite photos of "Metro Stations in Rome". Upload your photo of Pietralata!